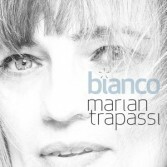 " BIANCO " , new Marian Trapassi album , is a story of universal stories, which speak through metaphors of life and its facets, and personal, that is, very intimate moments, in which the songwriter tells. Bianco marks a new chapter in the artistic career of the Sicilian singer-songwriter, but Milanese by adoption: detached from previous works and imposed with a precise and homogeneous style, ranging from jazz, blues, folk, with 12 elegant and refined songs in arrangements and writing. Musically, the album is inspired by modern French chansonniers and great Italian and American singer-songwriters.